The Nasdaq has pushed to new highs for the year last week, but other market indices like the S&P 500 and Dow Jones Industrials have acted a lot weaker recently. The lunar green period will be ending today, and then we will enter an eclipse red period, as we are approaching a solar eclipse on November 3rd. What does that mean for the market going forward? 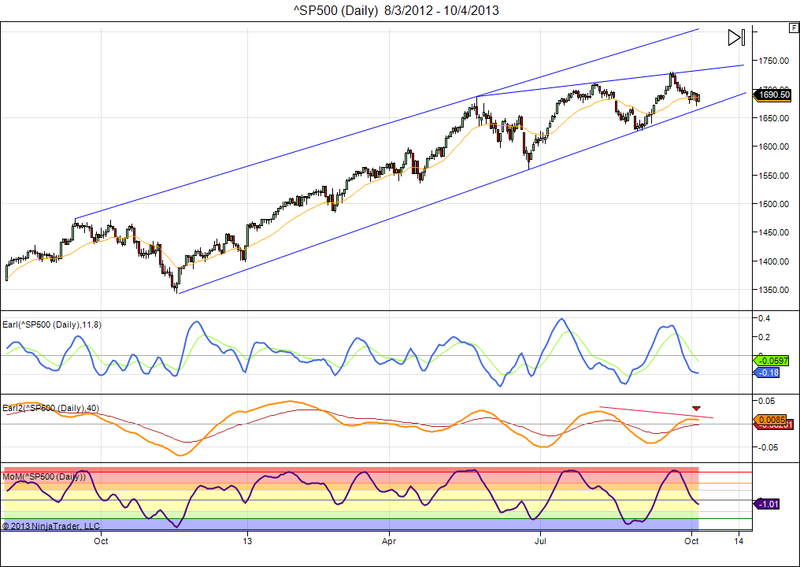 The S&P remains in a rising trend channel, and appears to be forming a rising wedge since May. Rising wedges sometimes end with a sudden drop. The 1670 level is going to be very important in the next couple weeks, as it has been a frequently visited support/resistance level since May, and now we also have the bottom trend line coming in at that level. So any drop below 1670 would probably trigger more selling and imply sharply lower prices ahead in this eclipse red period. Technically the Earl indicator appears to be bottoming out, which suggests some kind of rally to start. But the slower Earl2 indicator is disagreeing and is just starting to go down, painting a bearish divergence with the early August peak. With such a mixed picture it is generally not a bad idea to stand aside. A short term trader can put in some stop-sell orders just below 1670, or buy a few put options to benefit from a potential drop. Remember, eclipse red period does not mean the market has to drop lower. But it is definitely a time to be very careful if you hold long positions. This entry was posted on October 7, 2013 at 1:56 pm	and is filed under Financial Astrology, Market Commentary. Tagged: Lunar eclipse. You can follow any responses to this entry through the RSS 2.0 feed. You can leave a response, or trackback from your own site. There are always a myriad of “other factors” that can and do come into play. And as my grandfather used to say: people only like statistics when they confirm what they believed already, and if they don’t then they will doubt the statistics rather than question their beliefs. Nobody ever said that statistics offer the whole truth, they only give us a piece of information that can be more or less useful depending on the case. What they can do is tell us how often something has worked in the past or how well it has worked. Statistics is nothing but keeping score over a long period of time. In the case of eclipses, over 60 years of history shows that it would have been a better idea to buy stocks in the weeks around a solar eclipse. The lunar green periods around solar eclipses have produced an annualized 17% gain, which is much better than the average 7% long term appreciation. This means that people who have gone short before a solar eclipse have usually lost money. It is what it is. Now, if the market happens to go negative after Nov 1st, based on your other astrological factors, then that may say something about those “other” astrological factors. But then it does nothing for the case of eclipses. Mark Twain was right and wrong with his quote. Statistics should be doubted, just like every other piece of information should be doubted until you can verify it for yourself. But once you have verified it, there is no reason to consider it a kind of lie. Whenever somebody quotes Mark Twain on statistics, I usually invite them to play some game of dice for money, adding: “and you won’t mind if I am using a loaded dice that gives me a statistical 20% better odds of turning up a 6, would you?